Threefold ergonomics = happy and healthy people! Bringing natural movement into your working environment requires unconventional solutions. The concept of 3D Ergonomics manufactured by aeris in Germany, the company has come farther than any others to provide you with the most innovative products in the world. With many years of research on movement and active sitting solutions, aeris has invested products that are practical, easy to use and made for us to use in just about any environment. So many of the up to 192 components in each chair come with patented technology that has won aeris multiple awards for innovation, design and function. What does that mean to you? Healthier people that are happier with how they sit every day of their lives! Just sit down on a Swopper. From birth on we are programmed for movement; we need movement for healthy development and a healthy life. Unfortunately our modern daily life demands hours of sitting and that is very hard on our bodies as you know! 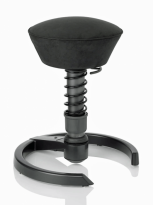 The swopper chair allows for constant movement, whether that be moving your hips side to side or a gentle bounce as you type at your computer. Static sitting is causing all kinds of issues for the modern day worker and the solution is having your chair work for YOU rather than the other way around. Get ready to change positions and MOVE during your workday to be a happier and healthier YOU! Burn up to 400 calories a day sitting actively on a Swopper! 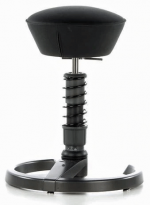 Unique and versatile bouncing movement in the swopper spring strut, developed by aeris with a highly complex 3D mechanism that allows for full body movement while seated. Overall height: 22.00" - 27.5"
Seat dimensions: 13.5" x 17"
note: dimensions are specified in inches. measured to 2018 BIFMA standards. This warranty is given to the initial purchaser and is valid for as long as the product is owned by the original purchaser. This warranty is in effect from the date of original sale and covers defects in materials and craftsmanship found during normal single shift usages; single shift usage is five (5) days a week, eight (8) hours a day. See Applicable Warranty Periods” below. Products covered by this warranty will be either repaired or replaced at swopper.com's discretion. Product repair or replacement of any defective part is the customer’s exclusive remedy for any and all product defects. Labor is not included. swopper.com accepts no other responsibilities or liabilities. Only those items free of misuse, abuse, accident, alteration, unauthorized repair, or damage by fire, flood, or other acts of God will be covered. Applicable warranty periods swopper – 5 years for materials o Normal wear and tear, abuse, fading and COM/COL o Matching of colors, patterns or dye lot warranty claims o Please do not return the product without prior authorization from us o Please send a written notification of the defect to Special Needs Computers along with a copy of the original invoice o For details, please contact customer service at 877-724-4922 or sales@specialneedscomputers.ca. Note: Wheels not available on classic.